Has LG gone for style over substance? 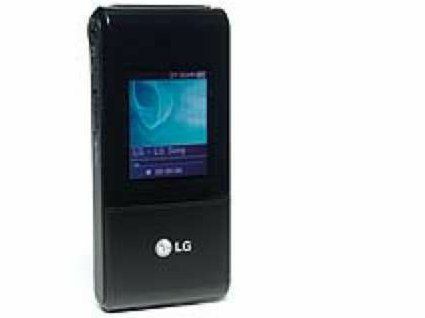 LG isn't afraid of outrageously stylish products, as its range of mobile phones has demonstrated. Some of that maverick spirit is also evident on the MFJM53 portable media player, which takes the bold step of removing buttons of any kind from the front of the unit, giving it a black, minimalist look. The controls are located on top of the unit instead, and feature a switch that lets you scroll through menus and doubles as an Enter key. It's innovative but hardly intuitive, given that you have to use your forefinger instead of your thumb. So what can this trend-setting gizmo do? It plays all the usual audio suspects - MP3, WMA (including protected files), OGG, WAV and ASF - plus MPEG4 (AVI) video files. You can also view JPEGs or text files on the 1.77in, 160 x 128- pixel OLED screen, and there's a voice recorder for making Alan Partridge-style memos to yourself. You can also make MP3 recordings from external sources. Sadly, there's no FM radio tuner, which you would have expected for the money, though other versions of the MFJM53 do offer it. Music files can be transferred using the convenient 'drag and drop' method, but videos have to be converted to a player-specific AVI format, then transferred to the unit using the supplied LG Media Center software - as do photo or text files. The software is laid out similarly to Media Player, but is nowhere near as easy to use. The unit is a bit picky about the video it can display: it refused to even transfer our WMV test clips, let alone play them (despite the unit's compatibility with Windows Media Player) while some of our DiVX files appeared on the unit's media list, but wouldn't play. Once you've mastered the tricky button arrangement, you can start to appreciate the user-friendly menu system. The Home menu is a bright, icon-driven interface where you can choose which type of media to play, while the EZ button brings up a list of handy options relevant to the media you're currently playing. On board is an Auto EQ mode, which optimises the sound quality depending on the genre of music you're playing, plus LG 3D Sound, which attempts to generate a more spacious soundstage and adds bass. Like other players, you have to turn the player horizontally to view video, so that it's presented in the correct aspect ratio. And like its rival, picture quality is excellent, with a healthy amount of detail, bright, vibrant colours and smooth motion. There's no escaping the slightly jagged lines around the edges of objects, though, but taking the limitations of the screen into account, the MFJM53 turns in an impressive performance. JPEG images also look superb, boasting good detail levels and bold, 'in-your-face' colours. And with MP3 and WMA files, the MFJM53 delivers a decent performance, provided you ditch the supplied headphones. Through good quality cans, the unit generates a punchy, dynamic sound, while the 3D Sound and EQ modes efficiently alter the sonic attributes for different music types.